Zhang Jigang, one of China’s premier choreographers and stage directors, put on a show of traditional Chinese and modern Western dance entitled ‘Thousand-Hand Bodhisattva’ in Yalong Bay on 10 February, 2013. The drama, which will unfold on the lawn of Huayu Resort & Spa Yalong Bay Sanya until 16 February, draws from the legend of the Thousand-Hand Bodhisattva. Thousand-Hand Bodhisattva has 12 odes and 12 dances in order to do justice to the grandeur and splendor of the legend. In the story, the ancient country of Dai is attacked by a plague and the king himself falls ill. With his life at stake, the youngest of his three daughters sets out on an arduous journey for the magical lotus flower which can save his life. Meanwhile the eldest, who covets the throne, sends a servant, Tongzi, to rob the princess of the flower and prevent the king from surviving. 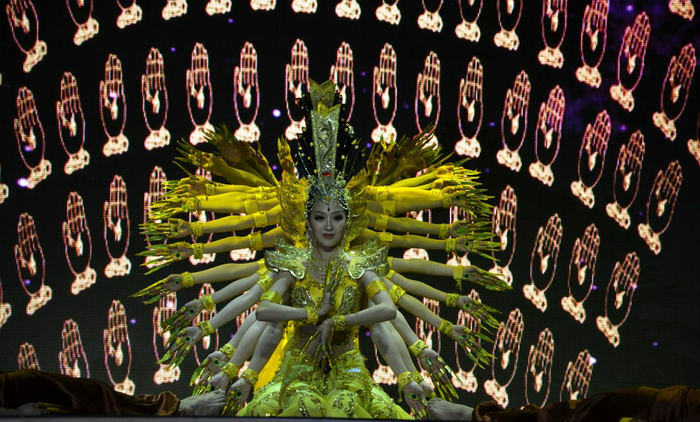 The Thousand-Hand Bodhisattva represents concept of caring and love and the audience were not only impressed by the oriental elegance and peace conveyed by the dancers’ performances, but also by their fantastic dancing skills.